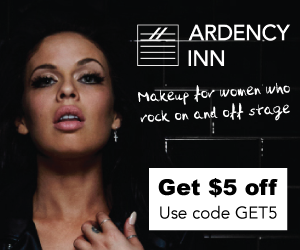 ARDENCY INN is a makeup brand born in the downtown New York music scene. Aiming to put the power of makeup artistry in the hands of not only recording artists but also every woman, they create high performance, cruelty-free color cosmetics that are quick and easy to use, allowing creativity to run free. With imagery that captures the edge and free spirit of downtown New York, ARDENCY INN represents a true lifestyle that resonates with music and makeup fans everywhere. Visit their website and scroll to the bottom of the page to sign up to get $5 off your first order + the latest on new releases, exclusive offers and more.